Giving and accepting gifts and hospitality has long played an important role in facilitating business relationships. Crossing the line between gift-giving and bribery, however, leads your organization down the road of reputation ruin. This holiday season, steer clear with a firm policy. What's the best corporate holiday gift idea? Arm your employees with knowledge on what is acceptable versus what could land them with coal in their stocking, and your brand on the naughty list. Gift-giving can easily turn to bribery in the corporate world and hefty gifts come with hefty price tags − namely, brand and reputation. In March 2014, Rolls Royce was investigated over bribery claims in the U.S., around the alleged payment to the son of a former Indonesian dictator to persuade the national airline to buy Rolls' engines. In light of the alleged request, it's easy to see how hefty gifts can have alternate meanings. In instances like Rolls Royce, those brands under ethical review are often required to fund such investigations. The fees have a direct impact on their financial bottom line − not to mention daily haranguing in the press and media about alleged improprieties, pushing consumer confidence and stock prices downward. It may seem abundantly clear what is considered acceptable versus what is considered not acceptable. One may think it is appropriate to accept a smaller token of appreciation, such as a gourmet chocolate bar. On the other end of the spectrum, one may also think that it is not appropriate to accept something more lavish, such as tickets to an event. Seemingly, those two choices are black and white. But what about the gray area? What if a gift is presented with 'strings attached', or contingencies? Are your employees knowledgeable on what is 'black and white'? There are countless other questionable scenarios that could occur − thus the 'gray' area of corporate gift giving. Fortunately, there are corporate gift giving tips employees can keep in mind during this season, as well as throughout the year. Ensure staff are aware of your gifts and hospitality policy − Ensuring everyone is aware of the policy is a great first step. Surely many have seen such a policy during onboarding, but it's good practice to remind them during this season (and throughout the year, periodically) so they are educated and empowered to make the right decisions. Type and value of the gift or hospitality − Some policies state food, but not alcohol can be accepted, while others are more broad. Furthermore, some have a maximum gift value to be given or received. It's good to know this in advance, to prevent a possible decline of the gift. Never accept a gift worth more than corporate guidelines allow. To prevent any suspicion of impropriety, never accept a gift on the condition future products or services would be purchased. Roles of parties involved − The intent of a gift or hospitable act from a vendor to a client is well-understood. But for vendors to offer a gift to a regulator, trusted official, or other entity where third-party, impartial judgment may be required is considered poor form, and possibly illegal. Be sure roles of gift givers and recipients are very clear. Sometimes even the potential of unethical behavior is enough to raise more than suspicion. When in doubt, steer clear. Location gift/hospitality is given or received − Organizations that operate outside their home market need to be particularly aware of cross-cultural differences in what is considered appropriate in gift giving and accepting. Various countries and regions operate with different social mores and cultural norms. Accordingly, what may be acceptable in one region may not be in another. This is further complicated in multinational organizations, where employees of differing national and ethnic backgrounds may not work in their native country or region. It's easy to see how confusion can set in about what is acceptable versus what is not. Furthermore, while in some markets, gifts and hospitality are a widespread and fundamental part of business transactions, regulations can have extraterritorial reach. For instance, the UK Bribery Act made the giving and receiving of gifts and hospitality a significant concern for organizations and their employees around the world. Cumulative value of all gifts given to an individual or team − While a single bottle of wine or trinket may not trigger a specific threshold, it could be part of a collection of gifts over a given period of time − either to a person or entire team. 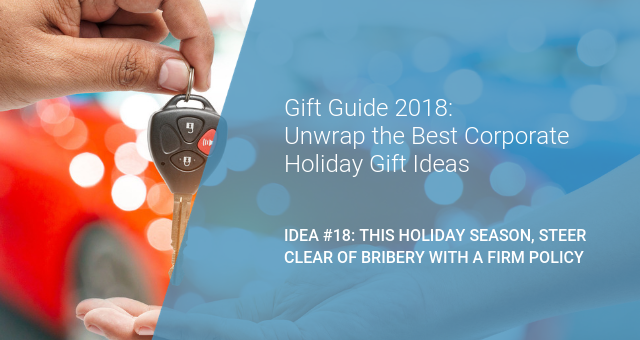 It's important to have a broader view into what your organization gifted to a person, team, or company to avoid overstepping a larger gift receiving policy. Further, as employees receive gifts, those need to be recorded to keep an accurate total received of volume and value. When in doubt, consult a manager, HR, compliance officer, your company's code of ethics, or online database of ethics training and learning content. It may seem awkward to ask, but caution here is better than running afoul of corporate policy. As suggested, track everything sent and and received to ensure compliance. Properly tracked gifts ensure compliance and demonstrate above-board behavior during announced or unannounced regulatory reviews. An email or spreadsheet is bound to get lost. Consider a more robust gifts and hospitality solution. It is the thought that counts. The goal of gifts and hospitality are to communicate to recipients the relationship is appreciated. Recipients and potential recipients need to communicate clearly what they can and cannot accept to avoid ambiguity or mixed messages. Above all else, enjoy the end of the calendar year and festive season.